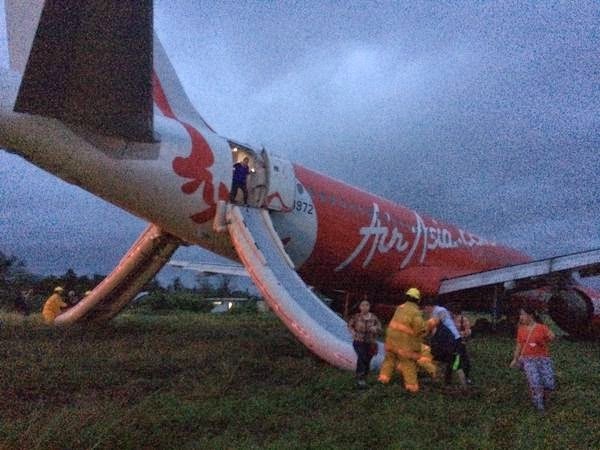 MANILA, Philippines - Another Air Asia plane was in trouble as the budget carrier AirAsia Zest with 159 people on board overshot the runway and got stuck in a muddy field at 5:43pm on Tuesday, December 30 at an international airport in Kalibo after landing from Manila in a bad weather. Officials said that there's no report of injuries after the accident on domestic Flight Z2 272 as crew members launched emergency slides to help passengers disembark from the Airbus A320-200. Civil Aviation Authority of the Philippines spokesman Eric Apolonio said that three of the plane's tires got stuck in the mud. Reports said that the flight to Kalibo was, like QZ8501, already delayed by two hours due to stormy weather. Kalibo town, 350 kilometers (217 miles) south of Manila, is a busy gateway to the Boracay Island, a worldwide popular tourist destination. The accident came after an AirAsia plane crashed into the Java Sea on Sunday during a flight from Indonesia to Singapore with 162 people on board. Search teams on Tuesday recovered at least 40 bodies from the sea near where the plane was lost.